with only the goslings making a splash. Poor, like ours. And ugly. into that slime of receding pond-water. At first sight, joy seems to be connected with being different. When you receive a compliment or win an award, you experience the joy of not being the same as others. You are faster, smarter, more beautiful, and it is that difference that brings you joy. But such joy is very temporary. True joy is hidden where we are the same as other people: fragile and mortal. It is the joy of belonging to the human race. It is the joy of being with others as a friend, a companion, a fellow traveler. This is the joy of Jesus, who is Emmanuel: God-with-us. Our editors recently reviewed your blog and have given it a 9.5 score out of (10). Your blog is currently rated #5 in the Entertainment & Recreation/Books & Literature category of Blogged.com. This is quite an achievement! We evaluated your blog based on the following criteria: Frequency of Updates, Relevance of Content, Site Design, and Writing Style. After carefully reviewing each of these criteria, your site was given its 9.5 score. Please accept my congratulations on a blog well-done! So you see, I AM famous!!! Go to Blogged.com (Books and Literature Blogs) and scroll down. what proved to be only a dusting. but the power of the clover. This trek begins near Pinnacle. A shadowed cow wades in a farmer’s pond. no longer dances in the wind. Eagles live on Pilot Mountain, just north of Winston-Salem. 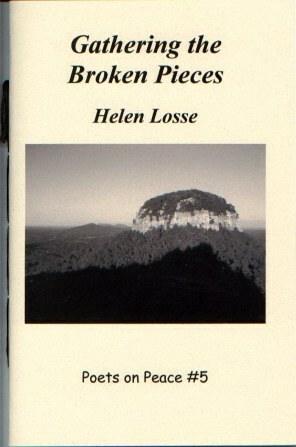 Cover photo by Bill Losse. See Karen Hopper’s poem here. I saw this picture on Collin Kelley’s blog. It’s so funny I had to “steal” it. Collin is a poet and a (D), or at least he’s going to vote for a (D). 🙂 Read his poems in the Dead Mule. Read the transcript for Mr. Balloon-Head’s latest speech on CNN. 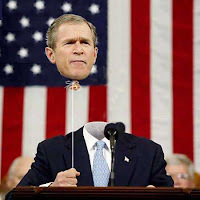 EDIT: I don’t hate Bush, er… Mr. Balloon-Head. I hate what he’s doing to my country. Outside, the clouds are gray. where no sun graces the darkness. in that honest prayer to the God Who Is. NOTE: I can always go back to where I came from, if it turns out to be better. Forgiveness often seems impossible, but nothing is impossible for God. The God who lives within us will give us the grace to go beyond our wounded selves and say, “In the Name of God you are forgiven.” Let’s pray for that grace.